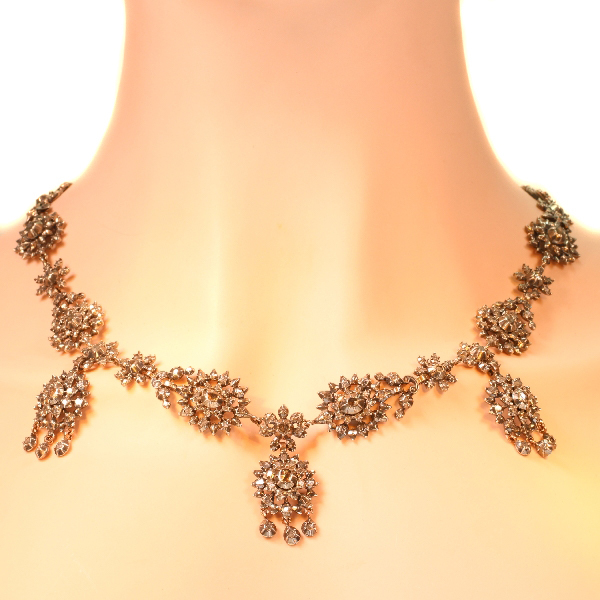 Antique Victorian diamond necklace: Description by Adin Antique Jewelry. From the first glance it seems obvious that this frivolous red gold backed necklace fits just elegantly around the neck as a garland of six larger flowers alternating with six smaller ones. As three more flower pairs with dangling triplets drape from this blooming aura, an abundance of foil-set rose cut diamonds encrusted in silver shimmer illustriously. Every antique jewel exudes history, but on top of that this enchanting necklace from around 1850 has also a modern story to tell about what jewellery can symbolize for a family. We were honoured to purchase this jewel from the heirs of a jeweller, who crafted this unique necklace out of his personal collection of four pairs of antique Flemish earrings. To find one complete pair of this type of earrings is incredibly rare, let alone having four pairs. Furthermore, all of his daughters were truly shining on each of their wedding days while wearing their father's creation. Although it isn't a custom of ours to offer redesigned/remodelled pieces, the way this jewel came to be is uttermost charming: initiated by a passion for antique jewellery, fueled by the vision and craftsmanship of a jeweller and truly ignited by the love of a father. Material: Silver on top and backed with 18K red gold (see explanation on silver on gold). Diamond(s): Many rose cut diamonds and senailles . A senaille is a simplified rose cut diamond, a small diamond chip with perhaps a few polished facets. We do not have the weight of the rose cuts diamonds nor the senailles which is normal in our trade when it comes to rose cut diamonds and senailles.